Ha ha indeed. We didn't get any flooring down yesterday as the wood is too hard!!! Apparently what Steven chose was harder than Brazilian Cherry and the installer didn't have a saw that could cut it, nor nails that could be shot through it. He ended up pre-drilling and hand nailing one piece and then left to get more tools and a blade with more teeth. This morning he turned up again with a huge circular saw and a very determined air. We shall see, but we lost a whole day yesterday. Outside we are still cleaning up from Hurricane Ivan that dumped several inches of rain on us Saturday morning, caused flooding all over the area and turned our front into a swamp. At one point the water filled the sunken bed outside the dining room and water poured into the basement. Luckily we were home and we ran with buckets to the sink and back until it stopped raining. Then I patched the hole with Dry Lock and started mopping. That took all Sturday PM and most of Sunday. after that we surveyed the damage. 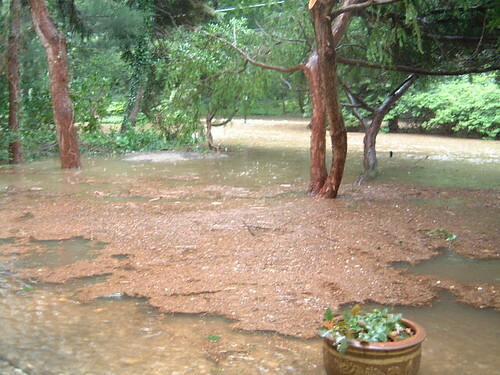 Our drive is 6" higher, thanks to the sand and debris deposited by the raging torrent that was Vineyard Rd. The other part of the drive is covered with leaves and pine needles where the water crested; apart from that the damage is minimal. We were lucky, lots of people had to go collect their drives from adjacent properties; we gained one. I'm hoping the Village will sweep it out but I'm not holding my breath.